In The Times published on the 21st September 1914, was one line “The London Irish Rugby Club have cancelled all fixtures for the coming season“. The next time they played again was against London Welsh on 18th October 1919. No club records seem to survive from these days but according to an article in The Irish Times published on 5th May 1919 ”The number of players known to have been killed is 28, but, a large number of members have not yet been traced, it is feared that the loss may be greater“. Another article published in the Observer on 21st September 1919 stated [I]“London Irish will be in possession at Norbiton of the best-appointed enclosure they have ever had. The outlook must necessarily be somewhat uncertain, as the war took very heavy toll of the back division of 1913-14, practically all being either killed or disabled. 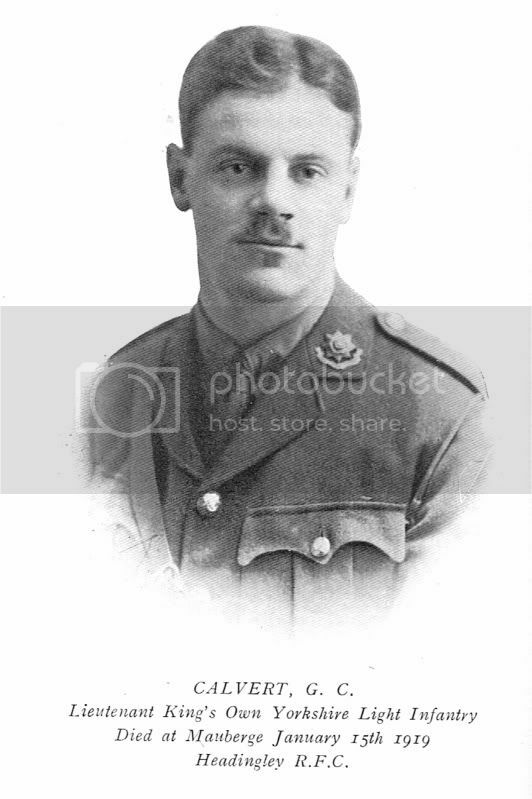 Was born 1883 Durham City and he died 25/04/1915 near Ypres. Second Lieutenant Thomas William Callinan, 8th Battalion Durham Light Infantry (T.F. ), who was killed on Sunday, April 25, near Ypres, was the eldest son of the late Rev. Thomas Callinan, vicar of Bearpark, and of Mrs. Callinan, Laburnum-avenue, Durham. He was born in 1883, and was educated at Bow Preparatory School and at Durham School, where he was captain of the XV. And head of the school. Proceeding to Cambridge, he was a scholar of Queens’ College and graduated B.A. in 1905, taking Classical Honours. He rowed in his college Eight and was captain of the XV. After holding appointments as assistant master at Knightsbridge Grammar School and Modern Language master at Bramcote School, Scarborough, he was appointed Modern Language master at Merchant’s Taylor’s School. There he was a member of the O.T.C., and on the outbreak of war he joined the Durham Light Infantry. He was well known in Rugby football circles in London, playing back for the London Irish, and twice representing a London team against Paris. His colonel writes :- “Up to the time he fell he had behaved must gallantly. He was an excellent officer and very popular, and had been of great assistance to me with his knowledge of French”. Son of Mrs. J. M. Callinan, of 7, Western Hill, Durham, and the late Rev. Thomas Callinan. In the 1891 census he was aged 8, and living at The Vicarage, Broom, Durham (Auton Field). He was educated at Durham School pupil between 1897 and 1902. A Master and modern languages teacher at Old Merchant Taylor’s school 1912-14. He played at full-back for London Irish, and was awarded the 1st XV Backs Honours Cap for the 1913-14. In February 1914 played for London Welsh (along with London Irish’s C.W.R. Pantlin) v Cambridge University. As well as a rugby player he was an accomplished Tennis player and played in the Yorkshire Championship Tennis Tournament in Scarborough, in August 1913, winning the Men’s Singles Handicap 6-4, 6-2 against H.C. Eltringham, and the Mixed Doubles partnering a Miss L. Cadle. He lost in the 3rd Round of the Doubles. In 1913-14 was awarded the London Irish backs honours cap. In the Times dated 28th April and 3rd May 1915, he was listed as wounded, On the 1st July and 8th July 1915 he was listed as wounded and missing, and finally on the 6th August 1915 he was listed as Dead. He left behind a widow, Josephine Mellanby Callinan of 5 Laburnum Avenue, Durham. He is remembered on the Menin Gate Memorial, Ypres. "D, Callinan (London Irish) would have forced Middlesex to victory if one man could have done that, but the task called for four Callinans". Callinan T.W. April 15, 1915, 2nd Lt. D.L.I. The death took place at a hospital in France on August 22nd, as a result of wounds received in action on August 20th, of Lieutenant Edward J C Supple, 6th Battalion Duke of Wellington's Regiment, youngest son of Mr Edward K Supple, of Wetherby Lane, Harrogate. Lieutenant Supple was educated at Ripon Grammar School, and later became a master at Skipton Grammar School. Whilst at Skipton he enlisted in the ranks of the 6th Battalion, of which he was later to serve as an officer. Later he obtained a position on the staff of Belvedere School, Brighton, and his military training in Yorkshire was put to good use in the work of the Belvedere Officers' Training Corps. He displayed great enthusiasm in the training of this Corps, which rose to a high state of all-round efficiency, and on several occasions won the challenge cup competed for by the Brighton Preparatory Schools. Lieutenant Supple was a thoroughly good sportsman, and was popular especially in the cricket and football fields. As an officer in the West Riding Regiment, he was a general favourite with officers and men alike, and one of his comrades, writing to the lieutenant's father, says : "In the greatest danger he was always cheerful, and had a kind word for everyone. He was a good officer, and one of the bravest men I ever knew". LIEUT. E. J. C. SUPPLE, 1/6th Duke of Wellington's (West Riding) Regiment, youngest son of Mr. E. K. Supple, late of the Irish Constabulary, was formerly a Master at Skipton Grammar School; he died of wounds received in action. Lieut. Supple joined the 6th Bn. in March, 1909, as a private. 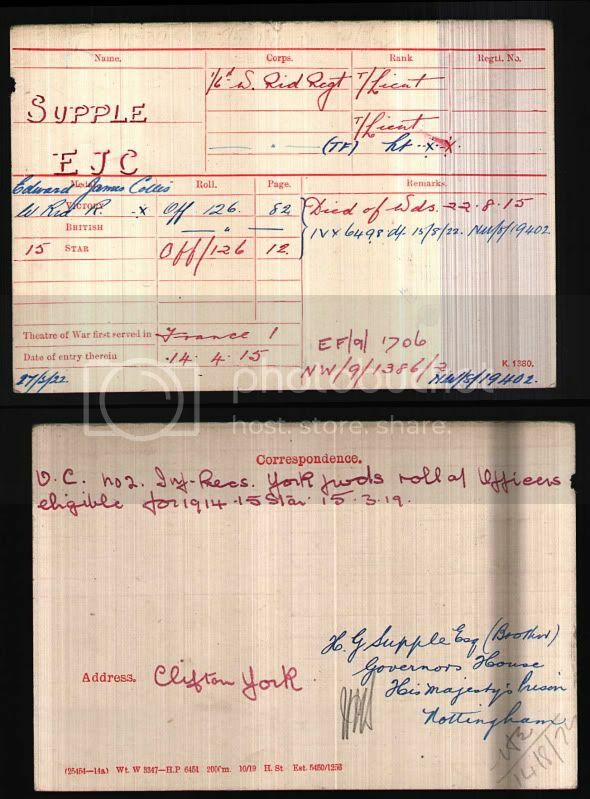 In 1911 he was promoted Lance Corporal and took his discharge in 1913. After the outbreak of war he obtained a commission and rejoined his old regiment. Lieut. 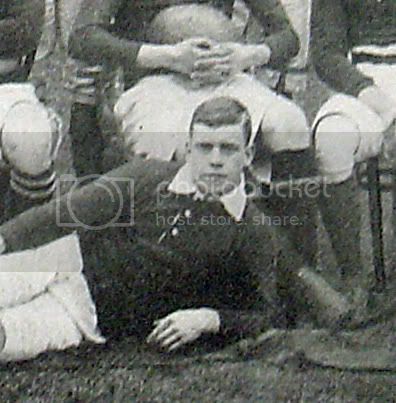 Supple was a keen sportsman, and for some seasons played half-back with the well-known London Irish Team. Lieut. Supple was admitted to Wimbereux General Hospital on August 22nd, 1915, suffering from gunshot wounds through both thighs, and died the same day. He is remembered on the Skipton Cenotaph, the Hove war memorial, Ireland’s memorial record 1914-1918, the Craven Roll Of Honour, The Skipton Holy Trinity Church Memorial, the rear plaque on the Harrogate, War Memorial and on a wooden plaque in the Skipton Cricket Club. He is buried at the Wimereux Communal Cemetery in France. Born at Abbeyfeale, Co. Limerick, and died at Chatham 22nd February 1919, aged 32 years. Headstone, Gillingham Kent. Shamrock growing at base. 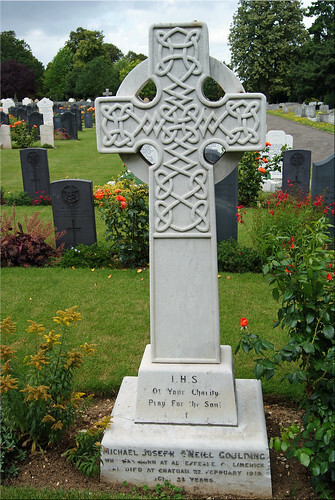 IHS of your charity, Pray for the Soul of Michael Goulding of Hertford who was born at Cahirciveen, Co. Kerry and died 22nd October 1924. 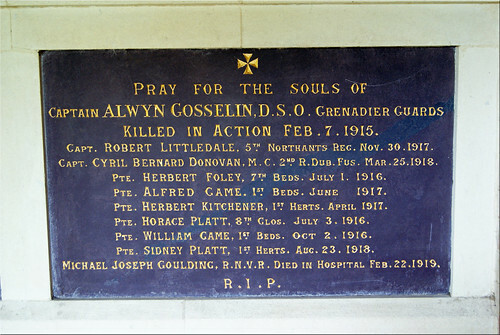 IHS of your charity, Pray for the Soul of Ellen Goulding wife of Michael Goulding who was born at Abbeyfeale Co. Limerick. Before the War Michael worked for H.M. Customs and Excise, at Custom House, London and later the Inland Revenue. In 1917 he married Bryde (Bridget) Gough in Shoreditch, London, who moved to Great George Street, Waterford after his death. 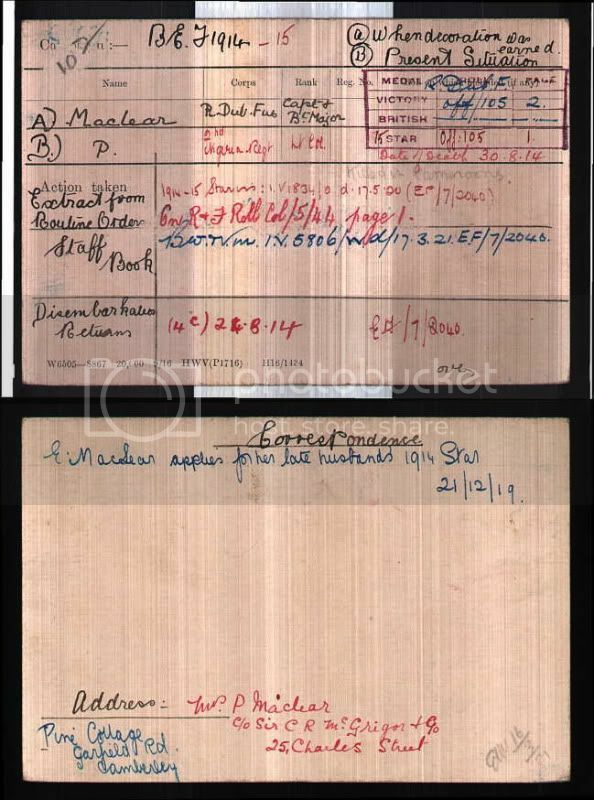 Pg1 Deaths - On 22nd February 1919 at Royal Naval Hospital, Chatham, Michael Joseph O'Neill Goulding aged 34, son of Mr. and Mrs. Goulding, Hazildene, London Road, Hertford. Pg 3 General County News Hertford - Mr. Goulding's Bereavement - We regret to announce the death of Michael Joseph O'Neill Goulding, R.N.V.R., at the Royal Naval Hospital, Chatham, after serving 2 years in the British West Indies. He was son of Mr. Goulding, Surveyor of Customs and Excise, Hertford, and had been employed in the Estate Duty Office, Somerset House. Deceased, who was a keen sportsman, was a prominent forward in the London Irish Rugby Club and the Middlesex County XV. He was also an able exponent of cricket and an ardent golfer. He leaves a young wife and child to mourn his loss, and there is much sympathy for them and his sorrowing parents. 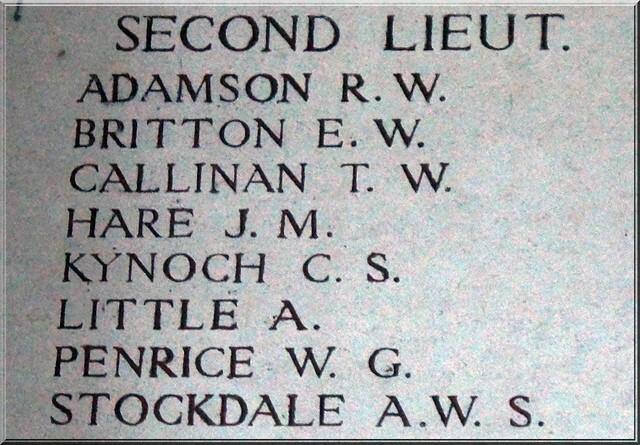 He is remembered on the Hertford Catholic Church war memorial. 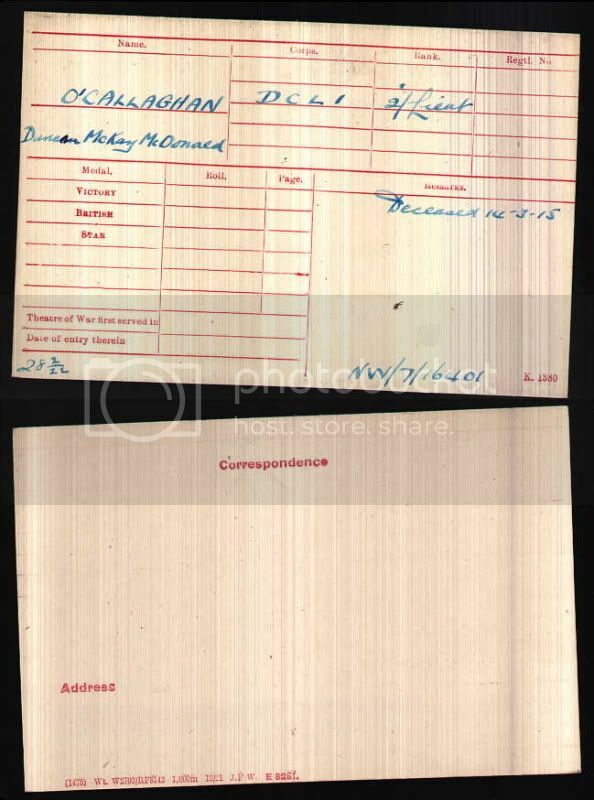 GOULDING, Michael J, Able Seaman, RNVR, London Z 7014, illness (pneumonia ). Was killed in action on the 30th August, 1914 at Garua, in the Cameroons. The third son of the late Major H.W. Maclear, the Buffs, and Mrs Maclear, born on the 22nd October 1875, and was educated at Bedford and the R.M.C. Sandhurst. He joined the Royal Dublin Fusiliers in September, 1895, becoming Lieutenant in March, 1897. From December, 1898 to December, 1902, he was Adjutant of his battalion, and was promoted Captain in February, 1900. While Adjutant he served with the 1st Battalion in the South African War, being present at the relief of Ladysmith and at the operations in the Transvaal, in Natal, and in the Orange River Colony in 1900, and again at operations in the Transvaal in 1901 and 1902. For his services he was three times mentioned in Despatches in the London Gazette 8th February and 10th September, 1901, and 29th July, 1902), was promoted Brevet-Major in September, 1901 and received the Queen’s medal with five clasps and the King’s medal with two clasps. He was employed with the West African Frontier Force from April, 1905 to March, 1908, during which time he took part in operations (1905-06) in the Kwale-Ishan district, South Nigerian, West Africa, being in command of his regiment. He was mentioned in Despatches (“London Gazette” 15th September, 1900?) . He was at the Staff College, 1911 and 1912. In 1908 he was awarded the Royal Humane Society’s medal for saving life in the River Nile at Khartoum. In April, 1914, he was again detached for employment with the West African Frontier Force, with the temporary rank of Lieutenant-Colonel, and was serving with the Colonial Forces when he was killed at Garua. His brother-Captain Basil Maclear, Royal Dublin Fusiliers-was killed in action near Ypres in May, 1915. He was fond of Football, and played Rugby for the London Irish and Sandhurst. Husband of Ethel Maclear of “Pinecot,” Gordon Road, Camberley, Surrey. Brother of Irish International Basil Maclear also killed in action, also another brother Lt Col. Herbert Maclear KIA in 1916. The Royal Humane Society - Bronze medal to Major Percy Maclear and Lieutenant H.C. Crozier, 1st Battalion Royal Dublin Fusiliers, for their gallantry in attempting to save Lieutenant Cooper, of the same battalion, who has drowned in the Blue Nile at Khartum shortly after midnight on August 12. The engagement is announced, and the marriage will shortly take place, between Wilfred Annesley Bickford, The Royal Berkshire Regiment. Elder son of Colonel Bickford, C.I.E., and Mrs Bickford of Camberley and Eileen Mary, only child of the late Major Percy Maclear, The Royal Dublin Fusiliers, and Mrs. Maclear , of Hildean, Camberley. BICKFORD : MACLEAR - On April 4, 1936, at St. Paul’s, Camberley, by the Rev. T.W. Heale, Wilfred Annesley Bickford, The Royal Berkshire Regiment, elder son of Colonel W.W. Bickford, C.I.E., and Mrs Bickford, to Eileen Mary, only child of the late Major Percy Maclear and Mrs Maclear. Maclear - In devoted memory of Lt.-Colonel Percy Maclear, Aug 30, 1914, and is beloved wife Ethel, Dec 18, 1933. E.M.B. Maclear - In devoted memory of Lt.-Col. Percy Maclear, The Royal Dublin Fusiliers, Aug 30, 1914, and his beloved wife Ethel, Dec. 18, 1940. E.M.B. He is buried Lokoja Memorial in Nigeria, and remembered on the war memorial at St. Martins Church, Bedford. There is no mention of John O’Connell Dodd or Kenneth D’Aguilar Houston (see below), in Peter Bill’s book “A Passion In Exile”, which I personally cannot believe. Both had a long playing history with the club, both where at one point vice-captain or captains of London Irish, J.O.C. Dodd was even awarded the forwards honours cap in 1909-10 season, and especially as etched onto his headstone in France are the words “Late Capt. Of London Irish Rugby Club”. 1901 Census - Age 17 Streatham 67 Chestnut Grove, Clerk in Insurance office. In 1909 he was the joint winner of the Starkey Cup at the first London Irish Athletic meeting, when he won the mile race and came second in the 440 yards and relay, and third place in the 100 yards. Served with the Royal Munster Fusillers in World War One. According to his will on Ancestry - Ballymacprior, Killorglin, Kerry. Died 07/11/18 in France. Widow Ellen Dodd effects £106 17s. 5d. (08/02/1919). Also lived: 83 Fernlea Road, Balham, SW.
5th Battlion Royal Munster Fusiliers attached to 11th Squadron Royal Flying Corps. Died (possible suicide) whilst as a Prisioner of War. 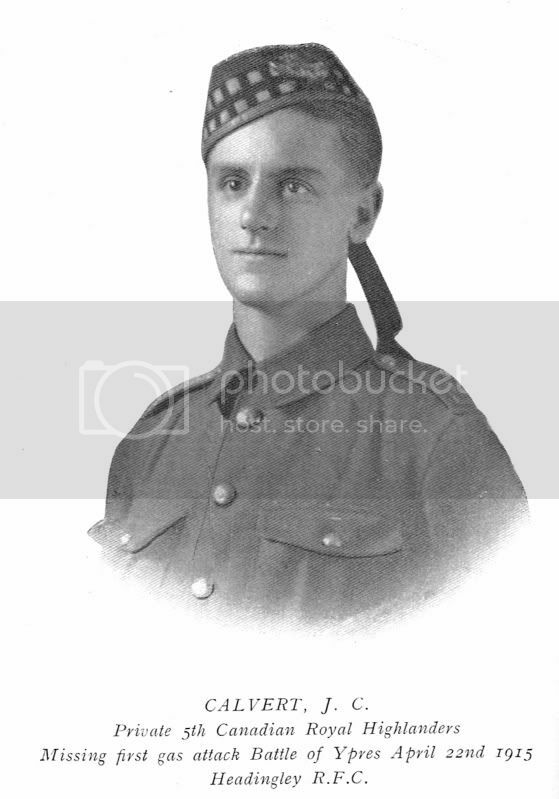 31/07/1917 aged 21. Buried at the H.A.C. Cemetery, Ecoust-St. Mein, Pas de Calais, France. Machine Gun Corps (infantry). 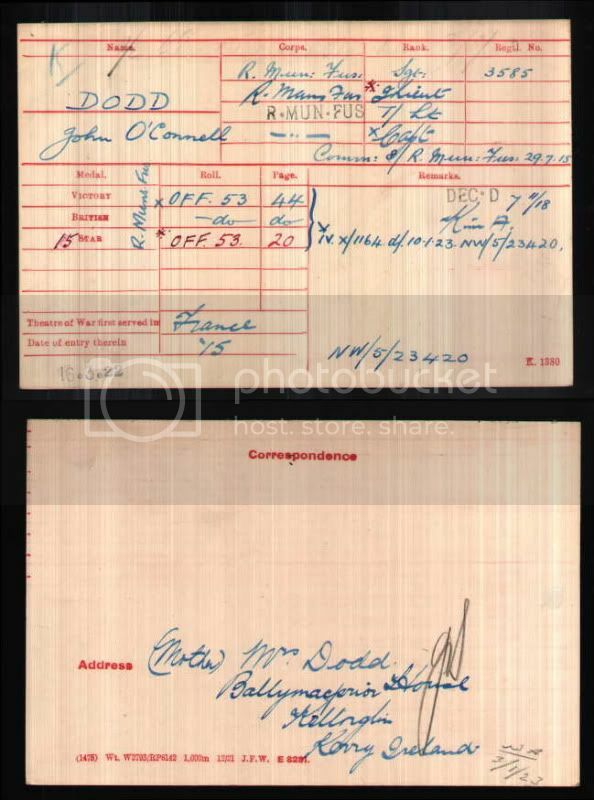 Enlisted with Royal Dublin Fusiliers in Sept 1914. Died 31/10/1918 aged 29. Buried Grantham cemetery, Lincolnshire. Passed The Law Society prelim examination 5th-6th May 1897. 1901 Census - Paddington, Christ Church Parish (Paddington South) 22 Westminster Gate. Age 20, born Ireland. Occupation - Solicitors Article Clark. (also at address Maud M. Croft, Age 30, Companion). He was awarded the 2nd XV Forwards Honours Cap in 1901-02. Vice-president of London Irish 1913-1914. London Gazette 18/03/1915 - County of London Battalion, The London Irish Rifles PRIVATE from the Inns of Court Officer Training Corps to be Second Lieutenant. London Gazette 18th Lond.R., 18/5/15; Capt. Killed in Action 24/03/1918 Aged 37 Captain 18th Bn. London (Irish Rifles) Regiment. Remembered on the Arras Memorial. The Times 11th July 1919 Will - (address of Mary Houston) 7 Vicarage Gate, Kensington, Middlesex & of Frinton, Essex. 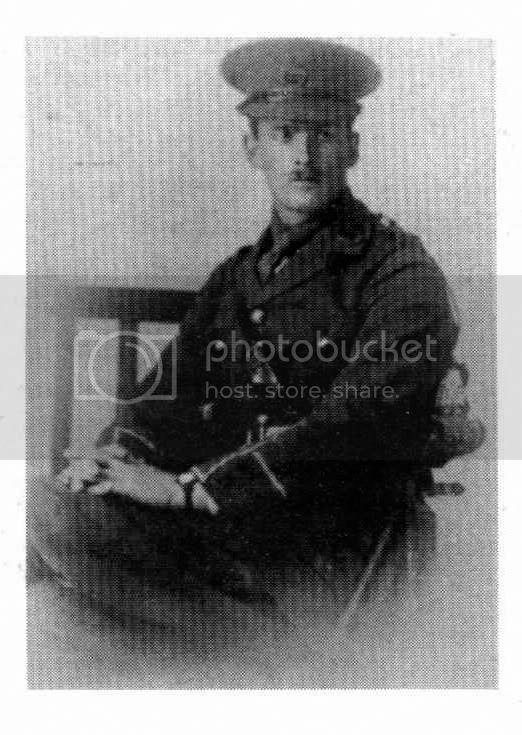 Captain London Irish Regiment died 24/03/1918 in France. 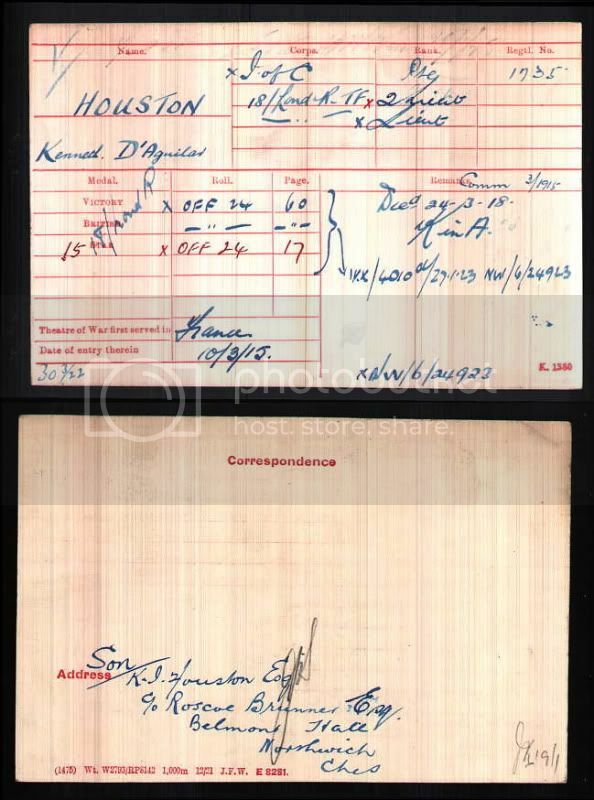 Effects £198 4s 3d to Percival Turner Houston. Will went to probate:- London Gazette 25th July 1919. Pursuant to the Statute 22 and 23 Victoria, chapter 35, entitled " An Act to further amend the Law of property and to relieve Trustees." NOTICE is hereby given, that all creditors and other persons having claims or demands against •the estate of Captain Kenneth D'Aquilar Houston, deceased (who died on the 24th day of March, 1918,and letters of administration, with the will annexed, to whose estate were granted by the Principal Registry of the Probate Division of His Majesty's High Court of Justice, on the llth day of July, 1919, to Percival Turner Houston, of No. 52, Gracechurch-street, in. the city of London., the testamentary guardian. appointed under the said will), are hereby required to •send the particulars, in writing, of their claims or demands to me, the undersigned, the Solicitor for the said administrator, on or before the 28th day of August, 1919, after which date the said administrator will proceed to distribute the assets of the said deceased amongst the persons entitled thereto, having regard only to the claims and demands of which he shall then have had notice; and he will not be liable for the assets of the said deceased, or any part thereof, so distributed, to any person or persons of whose claims or demands he shall not have had notice.—Dated this 21st day of July, 1919. -023 Administrator, 32, Bedford-row, W.C. 1. Administrator, 32, Bedford-row, W.C. 1. Lt. D.H. Quinn, Queen’s R.W.S.R. (attd. Welsh Fus. ), whose death during fighting against the Bulgarians is reported, was a well-known London Irish centre three-quarter. He was a fine all-round athlete, and endowed with a magnificent physique, standing 6ft. 4 ½ in., and weighing 14 ½ stone. He was born in Tarbert, Kerry and was still living there in 1901 aged 7 at 13 in Bridewell Street. His family moved to Wimbledon. He is buried in the Doiran Military Cemetery, Greece. Played rugby for London Irish Won Public Schools high jump championship 1910. Captain - Royal Army Medical Corps attached to the Royal Air Force. Played 27 games for Cardiff 1911-12 & was awarded a club cap. Played for Cardiff against Blackheath at the Rectory Field in November 1911 (result 3-3) (recorded as J.B. Carson). Played for Blackheath 1912-13 against Harlequins, Richmond, Bristol & Cambridge University. In February 1914 he played for The Middlesex Hospital v The London Hospital in the semi-final of the Hospitals Cup (London won 10-0) (recorded as J.B. Carson) The Times dated 27th February 1914 reported “and J.B. Carson also played well, but was apt to overdo his kicking to touch” . Died 09/08/1918 buried at Cairo War Memorial Cemetery, Egypt. Capt., General List (Dentist). yst. S. of Thomas Carson, of The Knowe, Larne, co. Antrim, by his wife, Mary, dau. of John McFaul, of Glenarm, co. Antrim; and brother to Lieut. Col. H.W. Carson, D.S.O. (q.v. ); b. Larne aforesaid 16 Oct. 1891; educ. Grammar School there; Middlesex Hospital, London, and The Royal Dental College, Leicester Square, London, W.; took the L.D.S. of the Royal College of Surgeons, England, in the spring of 1915; and was gazetted Lieut. 16 June, 1915, and promoted Capt. 16 June, 1916; proceeded to France 1 July, 1915, where he served with No. 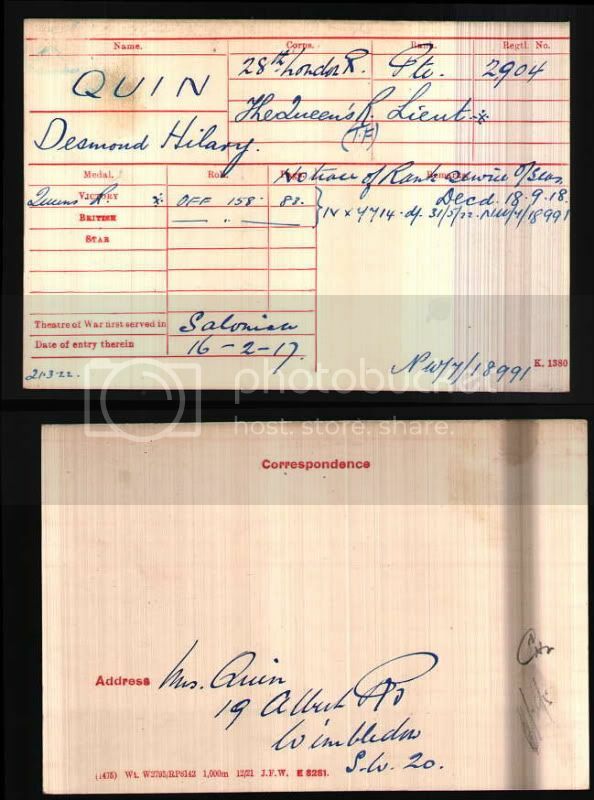 35 General Hospital as Dental Surgeon, and with Infantry Base Depot, Beaumarais, until 18 June, 1917, when he returned to England and was posted to Margate. In March, 1918, he applied for service abroad, and was shortly afterwards posted to Alexandria, Egypt, where he was attached to the Royal Air Force in the capacity of Dental Surgeon, and died in Alexandria 10 Aug. following, from illness contracted while on active service. Buried in the English Cemetery there. Capt. Carson was a noted athlete, playing football for Cardiff Rugby Football Club during the season 1911-12, and Blackheath Rugby Football Club in 1912-13, and also in Irish trial matches, and narrowly missed his cap against France. He was also an excellent cricketer and lawn-tennis player; unm. Dental surgeon attached to the RAF. Age 26. 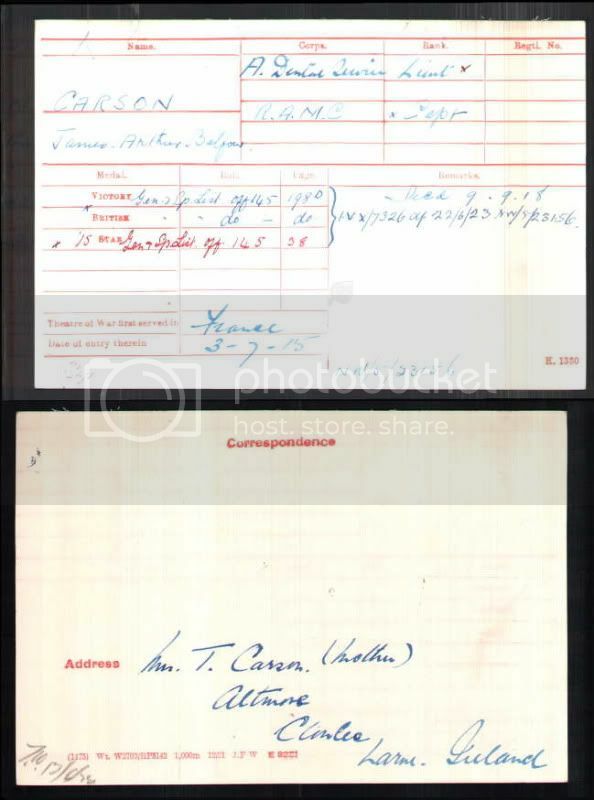 Youngest son of Mr. and Mrs. Thomas Carson, Larne, Ireland and brother of Mrs. Martin Richards, 1 Westbourne Crescent, Cardiff. Played for Cardiff RFC, Blackheath and London Irish. From Cardiff Rugby Football Club: History and Statistics 1876-1975, D.E. Davies. “First XV caps were awarded to ... J.A.B. Carson (and others)”; “the Ulster man got five” tries. (page 67). Carson J.C. August 1918, Lt. R.A.M.C. Duncan O'Callaghan was Art Master at King Edward VI School and became a Second Lieutenant in the Duke of Cornwall's Light Infantry, and was killed in the action of St. Eloi on the 15th March 1915.
o’Callaghan, Duncan McKay MacDonald, 2nd Lieut. 3rd, attd. 2nd Battn, Duke of Cornwall’s L.I., 2nd s. of the late Surgeon-Major George Henry Kenneth O’Callaghan, A.M.S., and eldest s. by his second wife, Suzanne Charlotte (Minto House, Newquay, Cornwall), dau, of the late Thomas Harding, of Wick House, Brislington; b. Ludlow, co. Salop, 4 June, 1891; educ. Cheltenham College and Trinity College, Oxford; obtained his commission 10 Aug. 1914, being gazetted to the 3rd Battn. Duke of Cornwall’s L.I., served with the 2nd Battn. In France and Flanders, and was killed in acion at St. Eloi, 14 March, 1915; buried in Military Cemetery, Dickebusch, Flanders; umn. At Cheltenham he won the Junior School Championship in Athletic Sports and represented the College in cricket and football. He was a college Prefect and Head of his House. On leaving, he gained a classical scholarship at Trinity College, Oxford, where he was elected member of the Oxford University Authentics Cricket Club. He played in the Freshmen’s and Seniors’ matches in football and cricket, and after leaving Oxford, was a prominent member of the London Irish Football Club. From Wisden Obituaries in 1915: 2ND LIEUT. D. MCK. M. O'CALLAGHAN (Duke of Cornwall's Light Infantry) was killed at St. Eloi on March 14, aged 25. He was in the Cheltenham Eleven in 1909, scoring 213 runs with an average of 21.30, and being the best bowler on the side: he took twenty-seven wickets for 19.48 runs each. Against Haileybury he did little, but in the second innings of the Marlborough match he played a rousing second innings of 66. In the first innings of the Oxford Freshman's match of 1910 he took three wickets for 24 runs, but he did not obtain his blue. He is remembered on Newquay war memorial, but also in Cheltenham, where he had lived as a child. O’Callaghan D McK M, March 14, 1915, 2nd Lt. This Ireland International seems to have been forgotten by the Rugby Unions lists of players who died in World War 1, which considering that he was the first schoolboy to play for the Irish national team is surprising. Born in 1878, he was educated at Collegiate School, Monaghan and the Royal School Dungannon, and also played for Dungannon. In 1896 he played for Ireland v Scotland and Wales. He played in the London Irish pre-season warm-up match at Alexander Palace in 1899, but I cannot find his name mentioned in the team lists for the first team that season. In 1901 he moved to Johannesburg, South Africa were he joined Ordnance Department, South African Constabulary, and was shortly after arriving injured in the Boer War. In 1903 he married a Catherine Hogate of South Africa. During the Great War he volunteered for active service, and in February 1915 he was gazetted 2nd Lieutenant with the Royal Flying Corps, and was later promoted to Lieutenant. He was stationed with the Royal Air Force in England in 1915 and then served in German East Africa. He transferred to South African Medical Corps. 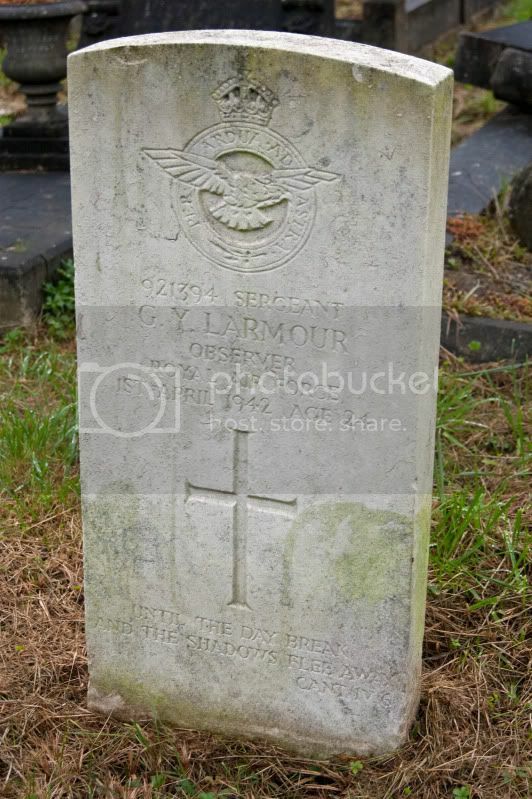 He died in December 1918 from the effects of injuries received whilst in the Royal Air Force. He was buried in the Thaba Tshwane (previously Voortrekkerhoogte, originally Roberts Heights) cemetery in Gauteng, South Africa. Below is an article from the Times dated 15th January 1919, Captain Eric Calvert played for London Irish and Eastern Counties, as far as I can tell his brothers and himself all played for Headingly. I know that his brother Reginald when to university in London, I have found him playing for Richmond, but he might at sometime during his studies played for London Irish. Lieutenant Geoffrey Clifford Calvert, Yorkshire Light Infantry, the secretary of the Leeds Chamber of Commerce, died on January 15, at a casualty clearing station in France, of typhoid and pneumonia. He was the third of Mr. and Mrs. Calvert’s four sons to die on active service. 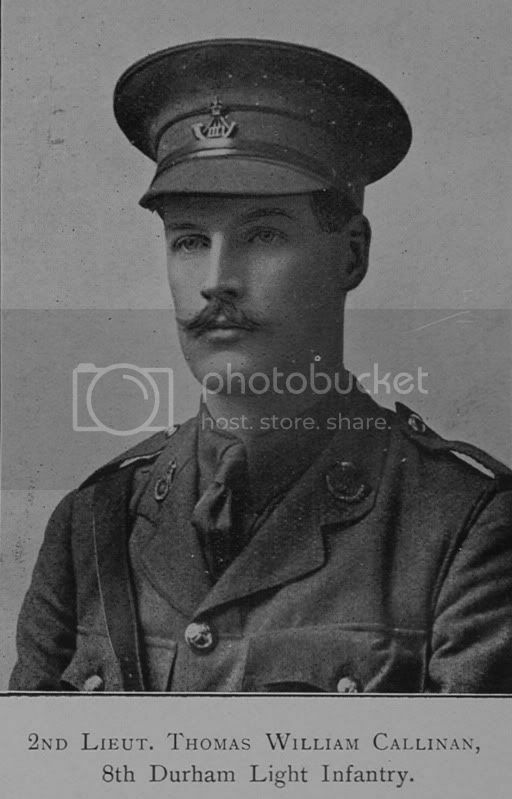 Capatin Reginald Calvert, the eldest of the brothers, and his father’s partner, was a lieutenant in the Leeds Rifles before the outbreak of war. He died of wounds in July, 1916. Private Cyril Calvert came across with the first Canadian contingent, and was reported missing after the first gas attack at Ypres, in April 1915; only recently his father has received news of the manner of his death. The third son, Captain Eric Calvert, M.C., was badly wounded in July, 1917, and is still in hospital. Lieutenant Geoffrey Clifford Calvert, the youngest of this brothers, was 24 years of age. From the preparatory school for Sedburgh he went to that school, where his brothers had been educated, and later was transferred to Oundle to take advantage of it’s facilities for training in engineering, the profession he had chosen. He had served two years of his pupilage with Messrs. John Fowler and Co. (Leeds) at the beginning of the war. While awaiting the commission, for which he applied at once, he enlisted in the Otley Howitzer Brigade. He was commissioned in the 8th East Yorkshire Regiment, and went to France with that unit in 1915. After a particularly trying spell of service in the flooded trenches of the Ypres salient, early in 1916, he was invalided home, and spent six months in hospital in London. He never recovered sufficiently to be fit for service on the line again, but after transference to the King’s Own Yorkshire Light Infantry he returned to France, and did duty in a forward area until he contracted the illness that caused his death. Lieutenat Calvert, who Leaves a widow and a son, earned distintion as an athlete. At his preparatory school he won the three-mile cross-county race two years in succession, and was awarded his colours in succession, and was awarded his football colours at both Sedburgh and Oundle. He played three-quarter for the Headingley Rugby Club, and represented the county in 1913 and 1914, scoring five tries in a brilliant game against Lancashire at Kirkstall. T./Lt. (T./Capt.) Edward Eric Calvert, E. Yorks. R.
1918, with seniority 29 Jan. 1917. Temp. Capt. E. E. Calvert, M.C., relinquishes his commission on account of ill-health caused by wounds, 26 Apr. 1919, and retains the rank of Capt. 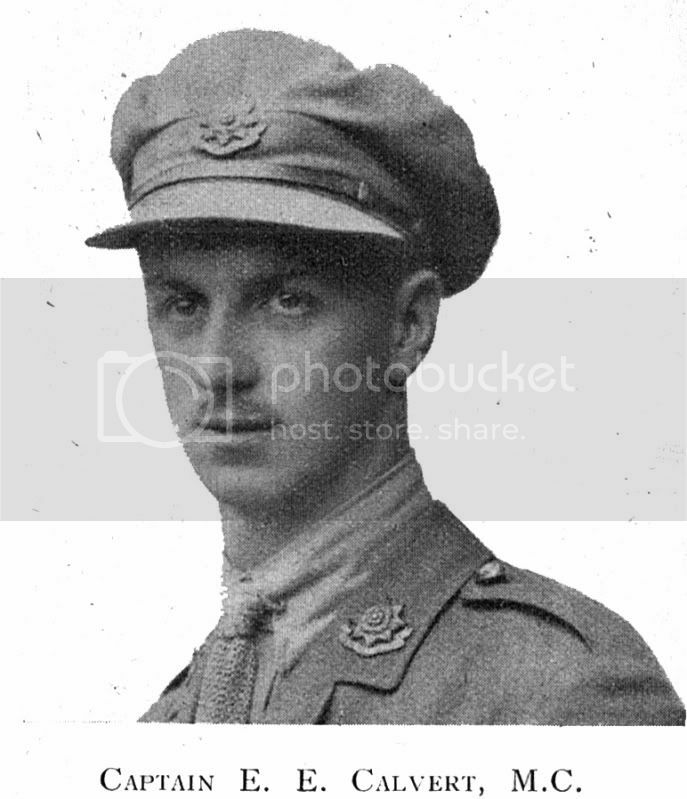 "Captain EDWARD ERIC CALVERT, who has been awarded the Military Cross, is the third son of Mr. and Mrs. R. K. Calvert, of Charnwood, Far Headingley, Leeds. Captain Calvert, who is 25 years of age, was educated at Sedbergh School; and at the commencement of war was a staff pupil with the Company at Fulham Station. 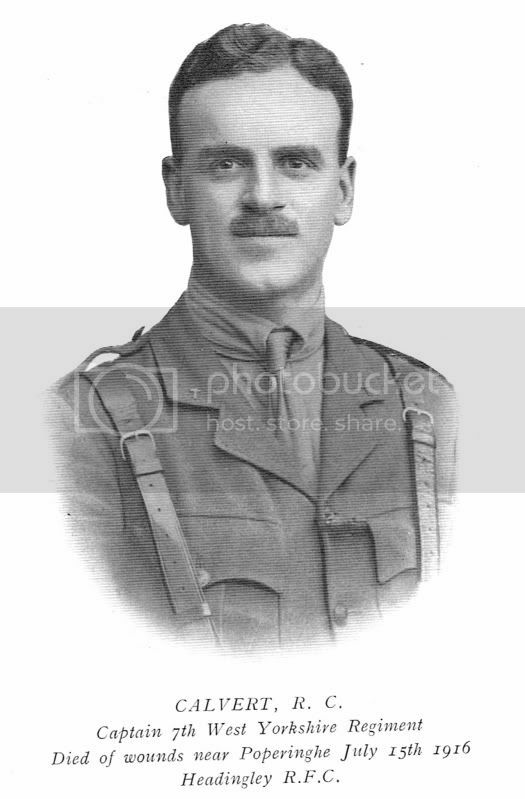 Immediately on the outbreak of war he applied for a commission; and, until granted, enlisted with his younger brother, Lieutenant G. C. Calvert, in the Howitzer (Otley) Brigade of the R.F.A., with which so many men of the Headingley Football Club were connected. He was shortly after gazetted to the East Yorkshire Regiment, and has had two years' continuous service at the Front. Like all his brothers, Captain Calvert was a prominent football player and a regular member of the London Irish team. He also represented on several occasions the Eastern Counties in their county matches." From what I can tell Eric married a Doris Maude Gallimore. It looks like they had two children, Doris born in 1922 and John born in 1923. In 1928 he worked as an engineer for the Gaslight and Coke Co., whilst living in Fulham. In 1938 he attended the Old Sedberghian London dinner. His son was killed in WW2 whilst serving with the Royal Air Force John's CWGC record. He died in 1957. Played for London Irish in 1937-38-39, and went on the mini-tour in Ireland in January 1938 playing against Dublin University, in the report from The Times dated 17 January 1938 “G.Y. Larmour played well at stand-off for London Irish. He made several good cut-through, and was excellent in defence.” “Larmour scored for London Irish“. Also played for the Westminister Bank v Catford Bridge in November 1937, in The Times report for that match said “The Bank went ahead when H.A. Bangor-Jones came away from a scrummage and passed to G.Y. Larmour, who cut through cleverly for a try between the posts”. Collided in the air, at 3,000 feet, and just below the cloud base, with a Beaufighter R2056 from 25 Squadron, piloted by Sgt D E A Welsh*. Both aircraft came down in the vicinity of Thrapston, 8 miles E of Kettering, Northamptonshire. Reginald Vere Massey Odbert was the London Irish guest player in the 1927 tour of Ireland. And played against Bective Rangers. He played for Ireland against France in 1928. He was born February 9 1904, Died July 18 1943 and is buried in Newark-on-Trent, and remembered on the Monkstown Church war memorial. In World War 2 he served with the RAF as a Group Captain. Well done Paul, great research. It looks like E.E. Calvert lost a son in WW2 also, I have just amended his bit. A fantastic piece of work; well done. In all that is going on in Europe and in the World as a whole it does us good to remember the sacrifices that these young men to whom we are loosely connected made. We are all indebted to you for a well researched and sobering piece. May all, and I mean all, victims of war rest in peace. Another great piece Paul. Well done. Loobs, you wouldn't believe how long it's taken and I'm (and Tony Bryne) still looking for others.